Gary Woodland and Amy speak and he shakes her hand saying, “I heard you’re a heck of a player.” The golfers then offer to let Amy take a shot, which Amy graciously accepts. 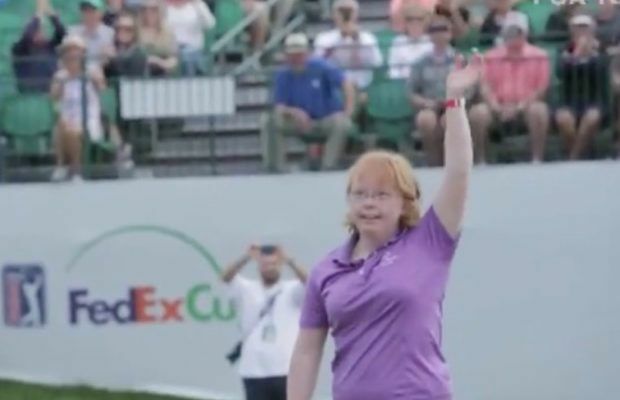 She isn’t at all starstruck by the golfers or overwhelmed by the camera crew. Instead, she is completely composed and professional the whole time. Amy and her dad/coach, greet the rest of the players and the little golf pro sets herself up for her tremendous swing. The ball sails away almost making it on the green but unfortunately winds up in a nearby sand trap. Woodland offers Amy a high-five for the shot, but Amy knows she isn’t out of the sand just yet. “I got this,” she says. After announcing yet another, “I got this,” Amy strode right into the sand pit and sized up her shot. A moment later, and with an audible “Plonk,” the tiny golf balls soars out of the sand and closer to the hole. The crowd goes wild at the shot. It’s a shot that, incidentally, more than a few other golfers would have trouble making. Millions around the country and no doubt the world saw what happened that day at the Phoenix Open. The tweet posted by the GPA Tour showing Amy’s entire experience has been liked more than 27,000 times, retweeted more than 8,000 times, and has almost 10,000 comments. The video itself, at the time of writing, had been viewed more than 3 million times.